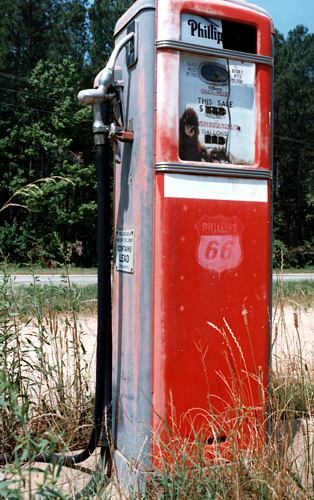 This pump -- location no longer remembered -- shows an earlier Phillips 66 logo, one that was phased out in the 1950s. But even then it was a shield and a big "66" under the Phillips name. The red, black and white shield with the large "66" in use today goes back to late in that decade. It has been modified over time to add a controlled background which embraces the fairly recent ConocoPhillips corporate name. But the elements of the shield are very much as they have appeared for well more than forty years now.